Intelsat stock has been nearly unstoppable in 2018, but it sold off with the broader market last month. Shares of Intelsat S.A. (NYSE:I) dipped 10.9% in October, according to data provided by S&P Global Market Intelligence. The satellite communications company's stock fell as the broader U.S. market posted its biggest percentage-based decline since February 2009. Intelsat stock saw a slight dip following the company's third-quarter earnings release at the end of October, but most of the stock's declines were tied to the gravitational effects of last month's market pullback. 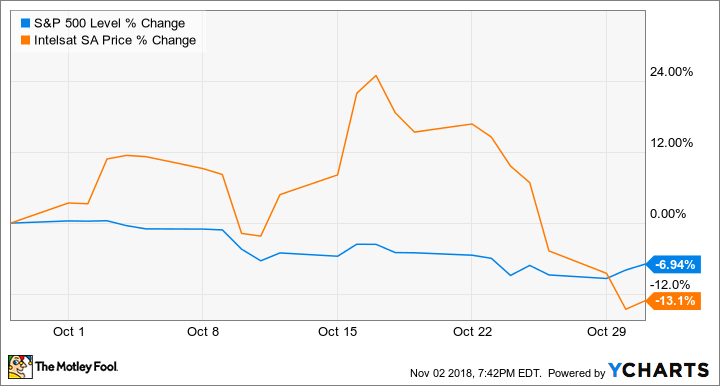 Despite October's sell-offs, Intelsat stock is still up roughly 680% year to date amid expectation that the company will provide wireless spectrum used for 5G networks. Intelsat published third-quarter earnings results before the market opened on Oct. 30, delivering sales that came in slightly ahead of the market's expectations, but losses that were significantly worse than the average analyst estimate. Losses per share for the quarter came in at $0.46 compared to the $0.34 per-share loss called for by the average analyst estimate and a per-share loss of $0.38 in the prior-year quarter. Revenue of $536.9 million came in ahead of the average analyst target of $524 million, but it was still lower than the prior-year quarter's sales of $539 million owing to some of its service offerings not being renewed. Despite posting another sizable earnings miss, high-flying Intelsat is down just 3% following its third-quarter results. Investors aren't focusing much on the company's near-term performance and are instead looking ahead to the possibility that Inteslat will play a key role in the deployment and expansion of 5G networks. The company published a press release on Oct. 1, outlining its partnership with Eutelsat, SES, and Telesat to set aside a range of the C-band wireless spectrum for use in next-generation networks and continues to coordinate with the Federal Communication Commission in hopes that some of the spectrum will be opened for commercial use.